Im Juni 1871 gründete Ernst Stoer (1846-1934) eine Buchhandlung, die lange Zeit am Markt angesiedelt war (an der Stelle des heutigen Rathausneubaus). 1921 ging sie in den Besitz von Johannes Trebst (1887-1972) über, der die Buchhandlung mit Wirkung vom 1. Januar 1923 in "Rückert-Buchhandlung” umbenannte. Gleichzeitig ließ er über der Eingangstür ein Holzrelief Friedrich Rückerts (1788-1866) anbringen, das der Würzburger Bildhauer Ludwig Sonnleitner (1878-1947) geschaffen hatte. In June 1871, Ernst Stoer (1846-1934) founded a bookstore that was for a long time located on the market square (on the site of today's new city hall). In 1921 it became the property of Johannes Trebst (1887-1972), who renamed the bookstore "Rückert Bookshop", effective January 1, 1923. 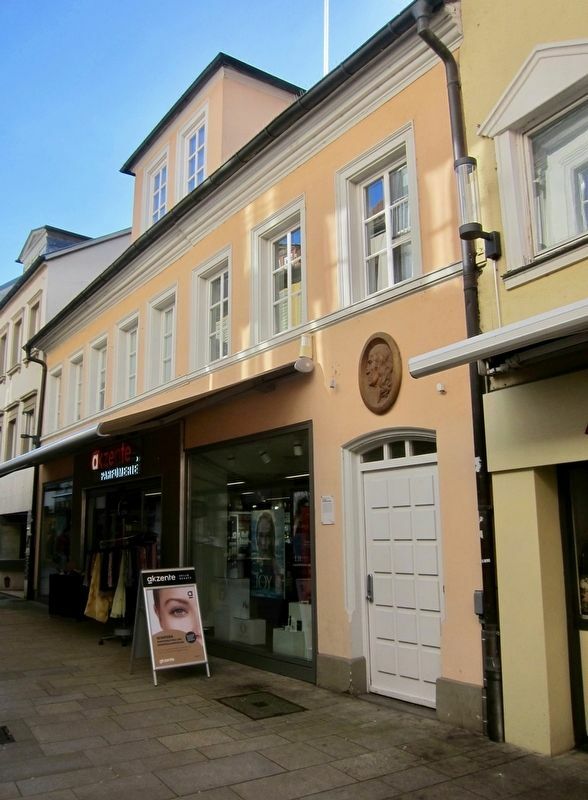 At the same time he had a wooden relief of Friedrich Rückert (1788-1866) affixed above the front door, which was created by the Würzburg sculptor Ludwig Sonnleitner (1878-1947). 50° 2.679′ N, 10° 13.973′ E. Marker is in Schweinfurt, Bavaria. Marker is on Keßlergasse just west of Markt, on the right when traveling east. Touch for map. 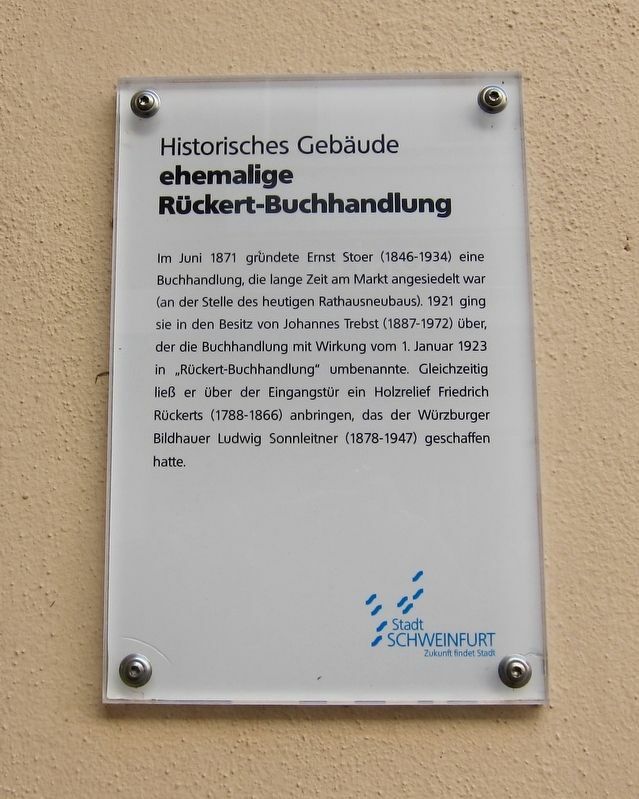 Marker is at or near this postal address: Keßlergasse 9, Schweinfurt, Bavaria 97421, Germany. Touch for directions. Other nearby markers. At least 8 other markers are within walking distance of this marker. Raven Hotel / Hotel zum Raben (within shouting distance of this marker); Professor Theodor Fischer (within shouting distance of this marker); Schopperschen Haus / Schopper's House (about 150 meters away, measured in a direct line); Dr. Martin Luther (about 150 meters away); Schweinfurter Schlachtschüssel / The Schweinfurt “Slaughter Pot” (about 210 meters away); Olympia Fulvia Morata (about 210 meters away); Engelbert Fries and Wilhelm Höpflinger (approx. 0.2 kilometers away); Städt. Sparkasse / Municipal Savings Bank (approx. 0.3 kilometers away). Touch for a list and map of all markers in Schweinfurt. More. Search the internet for Ehemalige Rückert-Buchhandlung / The Former Rueckert Bookshop. Credits. This page was last revised on March 25, 2019. This page originally submitted on March 24, 2019, by Andrew Ruppenstein of Sacramento, California. This page has been viewed 41 times since then. Photos: 1, 2. submitted on March 24, 2019, by Andrew Ruppenstein of Sacramento, California.